The AMP Project (Accelerated Mobile Pages) by Google has picked up steam and you should get into the bandwagon. Otherwise, there is a chance that you will miss out on heavy organic search traffic allocated for AMP based pages. If you own a WordPress site then it is easy to implement AMP versions of your posts using the official AMP plugin by WordPress. The plugin is called AMP, by Automatic. Since AMP is still new to many novice webmasters, customizing the output of the pages has become a great challenge. The aforementioned AMP plugin will create very basic AMP versions of your site which does not even include a menu bar or placement for Google Adsense Ads. As a webmaster, you definitely don’t want to miss out on ad revenue from Adsense from your AMP pages. So, here are 3 ways to insert Adsense code to your WordPress AMP pages. Before you get started, note that the Adsense code for AMP pages is stripped down to bare minimum. Consult this guide to have your Adsense code ready. Step 1: Open the Plugin Editor from the WordPress menu bar. Step 2: Select “AMP” from the Select Plugin to Edit drop down list and press Select. 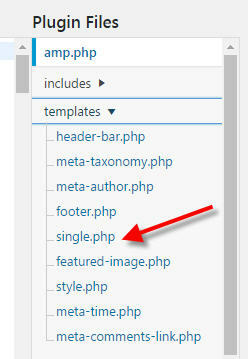 Step 4: Once you have the code for single.php visible, insert the code listed under Step 4 of this guide between the < head > and < /head > tags of your AMP html code. Step 5: Locate < div class = ” amp-wp-article-content ” > line. Usually line # 26. Then, just above the closing div, < / div >, paste your ad code which you prepared prior to executing method #1. Step 6: Save the changes by clicking on the Update File button. This page lists several ways of adding Adsense ad code to your WordPress site. The guide allows flexibility in placing ads in various places, including Before Content, After Content, after certain number of paragraphs, etc. The guide deals with updating the Functions file of your theme. Any update you make to the functions usually get overwritten during a theme update. As a result, it is strongly advised that you use a plugin like My Custom Functions before using the guide. The Ad Inserter Plugin for WordPress has a useful feature to insert ads in AMP pages. After installing the plugin, go to the Settings Page for Ad Inserter. Paste the ad code in a Block and click on the Misc button. Under Insertion tab, click on AMP Pages. This will place the ad code in your AMP pages.